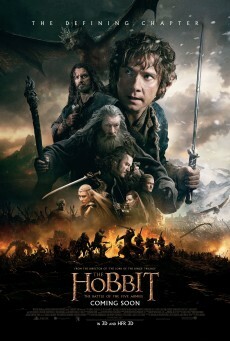 Peter Jackson's final installment of the epic trilogy based on a rather short book by J.R.R. Tolkien's in comparison with his Lord of the Rings, follows its predecessors in its release strategy. Like with The Hobbit: An Unexpected Journey and The Hobbit: The Desolation of Smaug (and of course the LOTR saga before that), The Hobbit: The Battle of the Five Armies is released in an extended version a year after its theatrical release. An early announcement by Peter Jackson was stating additional 30 minutes of material: more than any other Hobbit film before. However, this was a rather optimistic assessment. Also, there was much uproar in the media when the R-Rating for the extended edition became known: a more violent movie than any Lord of the Rings installment before that. Therefore, there were some expectations considering bloody extensions to titular battle. The Extended Edition, in fact, really pushes up violence: more than the half of the extended runtime is happening during the large conflict in the middle of the movie. Often they are rather bloody and feature dismemberments and decapitations (especially by using a certain war chariot) or just are more violent (Legolas turns his dagger in Bolg's head which is amplified by a crunchy sound). It is debatable if it justifies an R Rating or actually improves the movie - however, everybody has to see for himself. Without question, the longer version has been mostly extended by violence. There are no significant digital alterations in the bloody scenes; however, these are still present as such. Often existing scenes were changed in order to push them to a different direction - this can be mostly seen in Dain's first appearance with more/less army in the background; however, other scenes have been modified as well, for instance, during some of the moments between Galadriel and Gandalf. Also there are some tweaking by mirroring the image or changed audio which also cause changes without actual runtime difference. However, fans are mostly interested in added content and there are some nice bits here as well. Gandalf gets an additional scene involving his ring and an Orc torture master; Alfrid gets his rather comical demise in the extended edition, and finally, a much expected burial scene including some of the important dwarf characters is also included. Also, there is a nice night scene between Bilbo and the good-natured Bofur and a longer scene between Gandalf and Radagast. Dain and Thranduil's verbal confrontation is extended as well, leading up to an additional block of added battle scenes. In the Theatrical Edition you only see a shot of fire-breathing Smaug flying by. The Extended Edition features a different attack by Smaug. Bard is leaping from roof to roof, almost falling off. In the last moment, he manages to hold on by sticking an arrow into the roof. In the previous scene the threat "Spells will not save you, old man" has been removed together with the translating subtitle. Here we see an additional scene: Gandalf, locked in a small cage, is thrown around by the warden orc. The aforementioned threat is moved to this scene. Then the orc starts interrogating Gandalf while throwing him around further. Gandalf fends the orc off with a chain; however, the orc grabs him again and notices a Ring on Gandalf's finger. Here in the Theatrical Edition we at least get to see Gandalf's fall. Before Galadriel kills the orc, both versions feature alternative footage. In the Theatrical Edition you see the orc attacking Gandalf (including some mirrored images of Gandalf and a slightly different dialog). Galadriel is coming closer. The Extended Edition shows the orc positioning Gandalf in order to cut off his hand with a scimitar. Here Galadriel approaches him and says: "I come for Mithrandir. And I will leave with him. If you try to stop me, I will destroy you." Only the Extended Edition shows the orc disintegrating. Saruman and Elrond fight longer in the Extended Edition; meanwhile, Galadriel pleads to Gandalf: "Mithrandir... Come back." The following shot of Elrond from above is slightly longer in the TE (not illustrated). Now Galadriel also says in the Theatrical Edition: "Mithrandir... Come back." The Extended Edition features instead a camera movement backwards. In the next shot of Galadriel and Gandalf only the Extended Edition features some fighting in the background. The scene where Saruman defeats his first opponent is shown in the Theatrical Edition in a slightly longer shot, in the EE in a separate shot. Before Radagast joins in, you see his sled flying through the air; meanwhile, Elrond defeats several enemies more. Once again, Elrond is fighting a bit more in the Extended Edition. In the TE the previous shot of Radagast is shown slightly longer instead (not illustrated). In the Extended Edition, Saruman beats another enemy. In the following shot, Elrond is attacking another one. The fall of Elrond's opponent is also shown in the TE, however, this shot starts slightly earlier (not illustrated).